Parting out another 73 Monte Carlo. Original 454 LS4 245 hp car built in Arlington, Texas. Original color was Silver Taupe Metallic. The car has no motor, trans, or driveline. Dash is not in good shape - there may be some small hardware, clips, brackets etc. I also have 2 standard doors with soft ray glass, regulators, latches, etc. Why would you part that out? I appreciate the feedback. 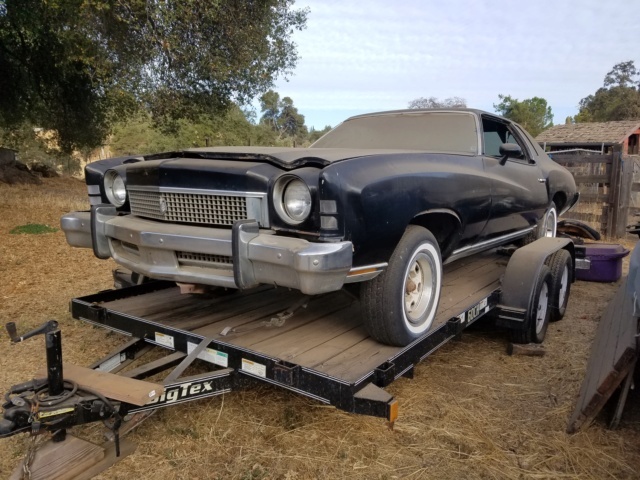 It is a tough call, however, when A body restorers need parts, I am finding that demand is greater than supply - even in California (not considering reproduction parts). I include myself while restoring my other 73. The last 73 that was parted went to 12 different states and included parts for a resto in Argentina from New York. A sacrifice of one for others? Is the car in TX currently? I saw it was built there, but not if that was the current location. I have some interest in the frame if it's got no rot. The car is currently in Sonora, CA. From everything I can tell and view from, the frame has no rot. I can follow up with some pictures for you to review. Appreciated, but I can't get it all the way back here. Didn't know where you were and was hoping it was close enough that I could rent a trailer and come get it. A couple states would work, but I can't do cross-country. Hi eboklund73. I just sent you a PM. Thanks. Hey. I guess the big block engine brackets went with the engine. I need a set of those for my big block swap into my '76 Laguna. Anything like that laying around? Thanks. REVINKEVIN: Thanks for the question - yes, the engine brackets are gone.